“They deride me. calling me ’needlepick’ - but let me ask you - what is sharper than a needle?" 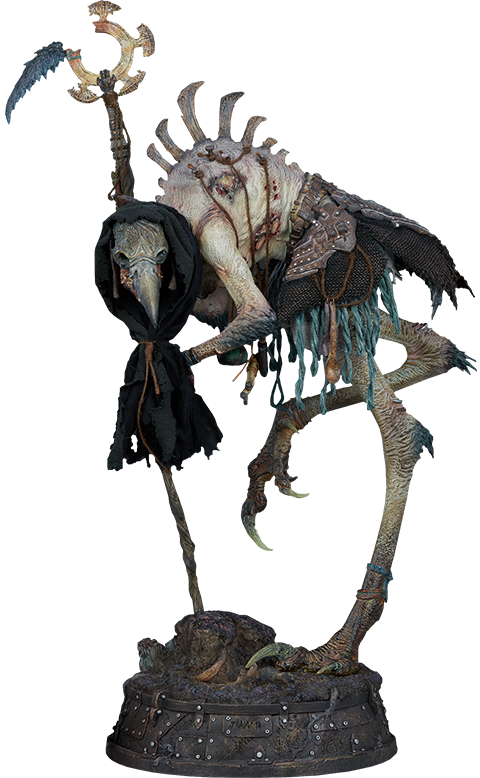 Sideshow presents the Poxxil: The Scourge Premium Format™ Figure. the latest addition to our original Court of the Dead collection. Not all those who reside in the Underworld toil selflessly for the Alltaker in support of his secret rebellion against Heaven and Hell. Some. like Poxxil. support the rise of the Underworld only insofar as it coincides with their own personal gain. Poxxil is a scourger. a type of reaper who scavenges and picks at the leftover and overlooked bits of etherea. "In this particular pose/moment in time. Poxxil is scavenging a war-torn battlefield.” explained sculptor Mark Newman. “He is collecting any last bits of spirit essence he can find from the fallen to feed his own life force." "My favorite sculpting projects are always creature-type characters where you can really let your imagination go wild without the constraints of conventional proportions. realism and likenesses.” Newman said.